"What's the deal with bad advertising?" 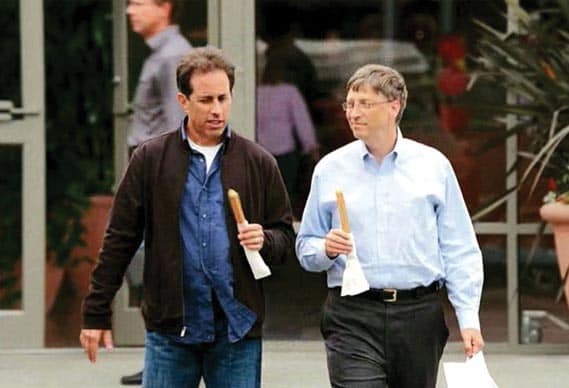 August 21, 2008: Microsoft recruits comedian Jerry Seinfeld for a series of ads. It’s a naked attempt to shake the company’s reputation as a stodgy oldster (as opposed to Apple’s trendsetting hipster image). Microsoft pays Seinfeld a reported $10 million for the ads. However, thanks to the Mac’s appearance in virtually every episode of Seinfeld over the years, the comedian remains the world’s most famous Apple fanboy. The Seinfeld ads were part of a $300 million Microsoft advertising campaign to overhaul the company’s image. They were a direct response to Apple’s “Get a Mac” ads, which humorously positioned Windows PCs as old fuddy-duddies next to the Mac. Cupertino tried to pigeonhole Microsoft this way for years. However, by the mid-2000s, Apple found itself in a less-assured position than it previously enjoyed. On December 30, 1999, Microsoft hit the height of its 1990s power and began a decline, clearing a gap at the top for Apple’s return to dominance. By 2008, Microsoft found itself floundering, thanks to the unpopular Windows Vista. Meanwhile, Apple benefited from a string of hits with the iPod, iTunes, the iMac and the iPhone. Apple overtook Microsoft in value in 2010. 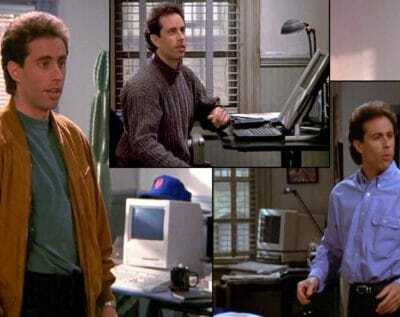 A look at Jerry Seinfeld’s Macs over the years. There was a certain irony in Microsoft trying to refresh its image by, once again, stealing directly from Apple’s playbook. The 1990s had been dominated by legal battles over whether Windows ripped off Mac OS. Then, the early 2000s saw Microsoft debut the iPod-like Zune and, later, the Windows Phone. A clever ad could have played with that idea in a subversive way, as if Microsoft somehow persuaded Seinfeld to jump ship. Instead, the campaign debuted with a badly received commercial in which Seinfeld helped ex-Microsoft CEO Bill Gates pick out shoes. The pair also talked about edible computers (seriously!). “The commercials were a train wreck from the beginning and only reinforced the idea that Microsoft is so far disconnected from regular consumers that it has no idea how to talk to them — even in an ad campaign,” noted ZDNet at the time. Microsoft pulled the ads within weeks, and never mentioned them again.